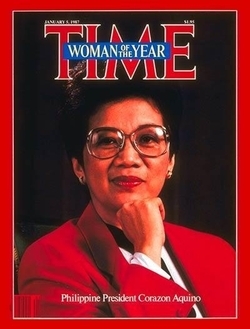 Time Magazine has only featured four women as "Person of the Year", one of them was Corazon Aquino from the Philippines. She supported her husband in his fight, she become the Filipinos hope to oust a dictator, she's every Filipino's Tita Cory. She was commonly and fondly known as "Tita Cory" (Aunt Cory) to many Filipinos. First President of the Fifth Republic of the Philippines and the first Woman among Philippine Presidents of the Republic of the Philippines. She was president from 1986 to 1992, and she is best remembered for being associated with the EDSA Revolt which overthrew Ferdinand Marcos and delivered democracy to the Philippines. Corazon Aquino claimed to be just a "simple housewife" who eventually married Senator Benigno Aquino, Jr. During the Marcos dictatorial era, Senator Aquino was a fierce detractor of President Marcos and his over-reaching powers. This conflict would later propel Ms. Aquino herself into the presidency. Maria Corazon Sumulong Cojuangco-Aquino (January 25, 1933 – August 1, 2009) was born into a family of landowners and politicians in the Philippines. She received what could be described as a privileged education in the Philippines at the time. The early 1940's where a difficult time in the Philippines, economically, as well as militarily, with the Japanese invasion of the Philippines in 1941. The family had enough money to send Corazon and her siblings to the USA to continue their studies at the time of the Japanese invasion. Upon returning to the Philippines and beginning to study law at Far Eastern University she met and married Benigno Aquino, Jr, who was an up and coming political star at the time. Benigno rose quickly within the Philippine Liberal Party and soon found himself Senator. Corazon stayed in the background, preferring to focus on raising her children. Senator Aquino, who was an articulate orator and a gifted statesperson and politician, quickly became the harshest and most vocal critic of the Marcos administration. He was eventually jailed and finally made his way to the U.S. Senator Aquino was assassinated on August 21, 1983 upon returning to the Philippines after three years in self-exile in the United States. After her husband's assassination, Ms. Aquino emerged as the leader of the opposition against the Marcos administration. She was finally declared the winner of the disputed February 22, 1986 Philippine elections, succeeding in overthrowing the Marcos dictatorship with the support of the military and leading the "1986 EDSA People Power Revolution." As president Corazon Aquino tackled many of the political, socio-economic, and other serious problems besetting the Philippines after over 20 years of mismanagement by the Marcos administration. She worked toward a new constitution, improved economic management, agrarian reform, and a complete overhaul of the executive, legislative, and judicial branches of the government. She declined to run for reelection in the 1992 presidential elections; but alternately backed and worked very hard for her preferred candidate – Fidel V. Ramos. Soon after peacefully stepping down from power, Cory Aquino never turned her back when it came to serving her country. She became the country's guiding force on national issues and likewise served as living proof that even presidents can be painless, humble and spiritual. These traits have especially endeared Corazon Aquino to all Filipinos.